Earlier this summer my cousins from Ohio came to stay with us and we took them to Coupville on Whidbey Island to have lunch and explore the town. It happened to be Whidbey Island Race Day with lots of sailboats out in the sound. I took a bunch of pictures to work this winter....which is what I am doing now! Also this time of year I cut up or paint over old work that has been lying around taking up space. Here are some progression shots of this painting using an old panel that I scrubbed with turpentine. My cousin Cindy and her two girls Mallory and Shayna were a lot of fun to have around for a few days!! While I'm on the subject of flowers, specifically roses , here is a recent demo painting done at the Cole Gallery in Edmonds during their Holiday show on Sunday. 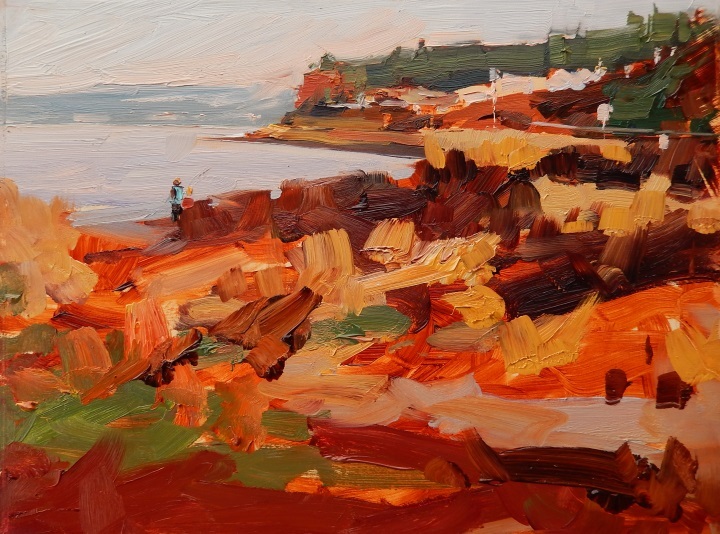 It was a fun time chatting with visitors and eating too many tasty snacks...If you are in Edmonds stop by the Cole Gallery and see whats on the walls. They have many fine local artists and a lot of my recent work is there too. 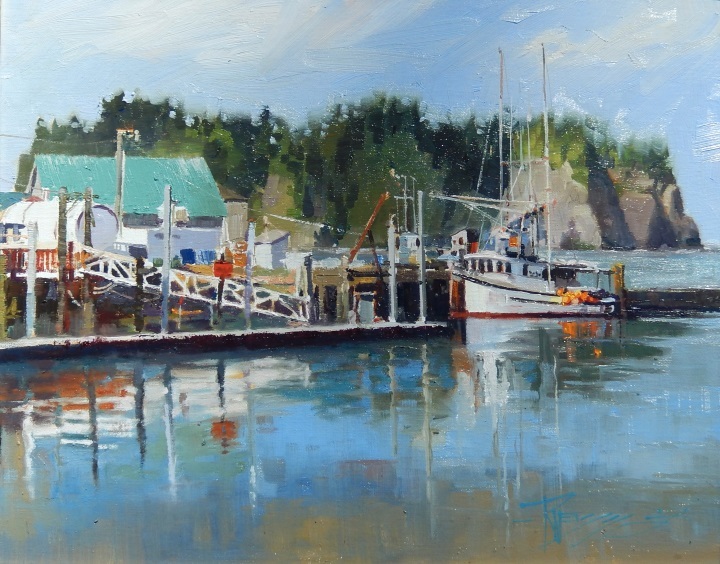 I took an early ferry over so there would be time to warm up with a little plein air work. I've painted this scene several times before but never this quickly. Crazy how fast the sun goes down this time of year! This painting took about 45 mins to complete! 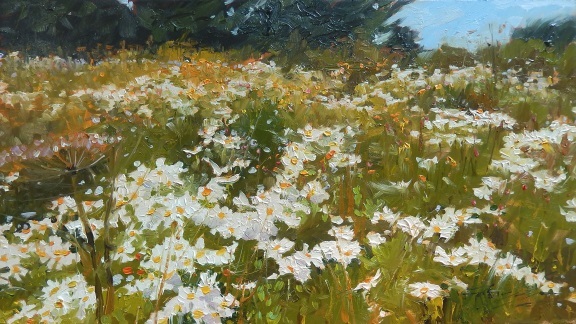 After finishing this painting, which went very fast as some do, I was wishing that I had photographed the process. This time of year I take stock of all the panels around the studio. Paintings that haven't sold or didn't work. Ones that had potential at the time but just stacked up. Hating to waste anything, these derelicts can sometimes be great foundations for new work. . In this case the painting was a mostly blue seascape, awful thing, that I turned upside down so as not to be too distracted and then used a photograph of a back lit, vase of roses on the porch. Working quickly with large brush and lots of thick juicy paint I blocked in the simple shapes and for once, stopped before overworking the thing. You never know what can happen! Give it a try! One of my favorite subjects! Seattle in the rain! We have been getting a lot of that lately but it just makes the city more interesting to me! 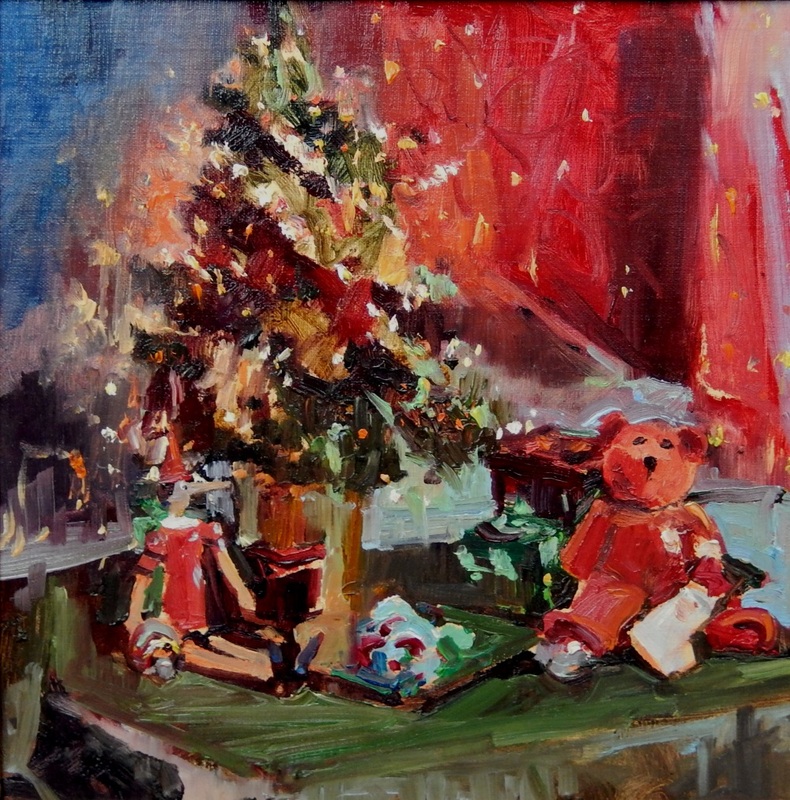 If you are in Seattle for Christmas this year stop by the newly opened Michael Birawer Gallery next to the Alexis Hotel and gift the gift of art to one you love this year. 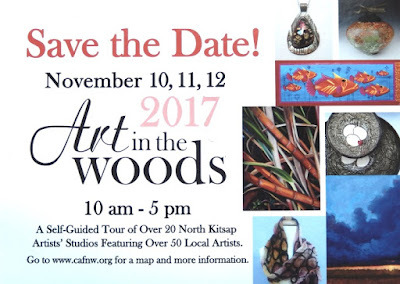 Oh, and stop by the Cole Gallery in Edmonds on Saturday the 9th! 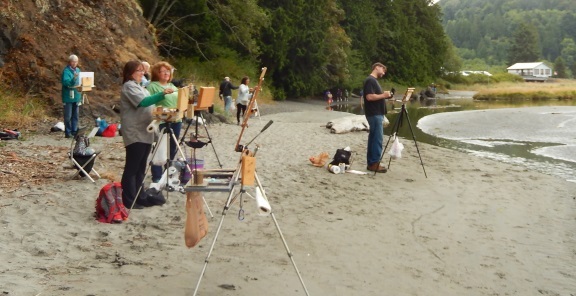 There will be artists demoing all day! 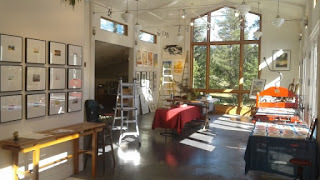 I set up my easel about 4pm! Would love to see you there! 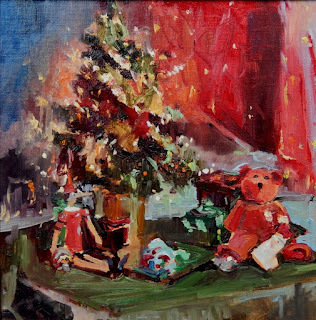 I will be giving a painting demo at the Cole Gallery in Edmonds, WA on December 9th for the Christmas Holiday Show form 4pm till 8pm , Come down and see the show and join with us in sharing the joy of the season. 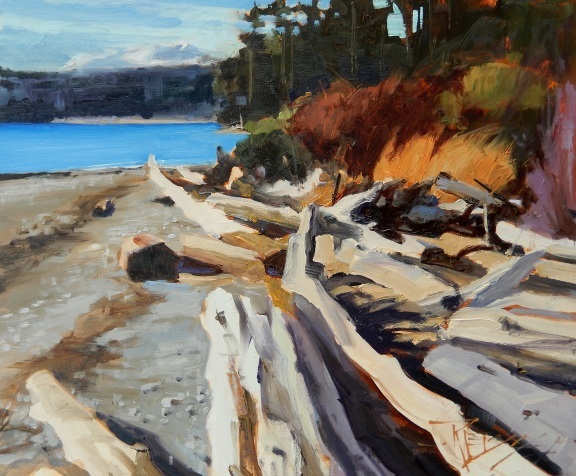 Also available and on display at the Cole Gallery is my painting "Dungeness Tidelands" a large studio painting of the Dungeness Spit and the Olympic Mountains which just won Best in Master Class Award in the Art Muse Contest online. 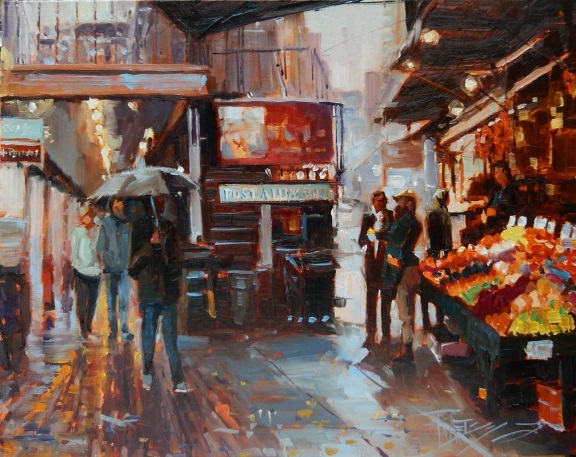 Pike Place Market is iconic Seattle! I always find interesting subject matter there and always have a blast painting on location. If you plan on visiting Seattle be sure on taking time to explore Pike Place Market. While you're at it, walk a few blocks south on First Ave and Visit the Michael Birawer Gallery. 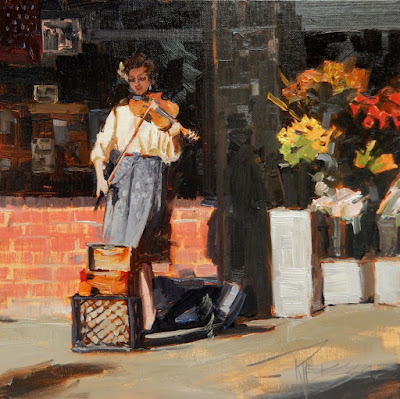 A new gallery in Seattle featuring some of the best regional artists in the area. This studio painting was inspired by a plein air painting that was a demonstration during my workshop this year prior to Paint the Peninsula. 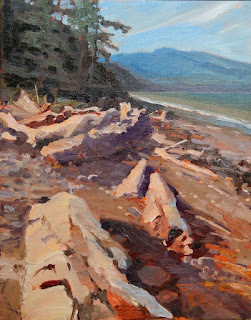 We had such a good time at this workshop painting on the Olympic Peninsula that I have decided to try it again next year. If you are interested in joining us send me an email and I will get you on the list to receive email updates. I have yet to post anything about Paint the Peninsula 2017. It was a great event again this year and I will get to it soon. 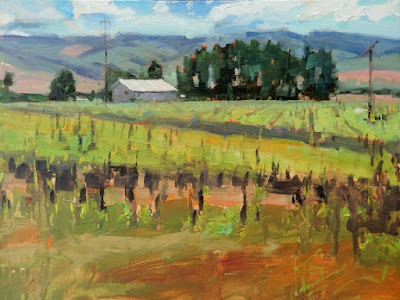 This large studio painting was derived from plein air studies I did on location at the Dungeness Wildlife Refuge in Sequim, WA. 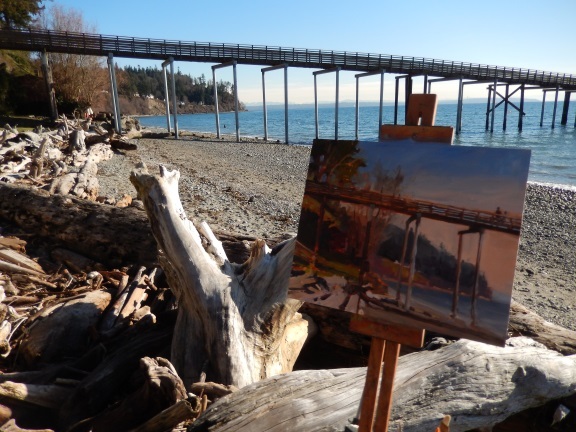 during this years Paint the Peninsula. I was able to spend the whole day there and did three studies. The Dungeness Spit is a long crescent of beach that stretches for five miles and ends at the New Dungeness Lighthouse. You can even make reservations to stay the night there and help with the lighthouse operations. I have painted on the spit for the last several years during PTP and honed my skills painting driftwood. I find the designs, textures and patterns made by driftwood on the beaches of the Northwest endlessly inspiring. You can go to the same place each year and the driftwood will make the scene entirely fresh again. 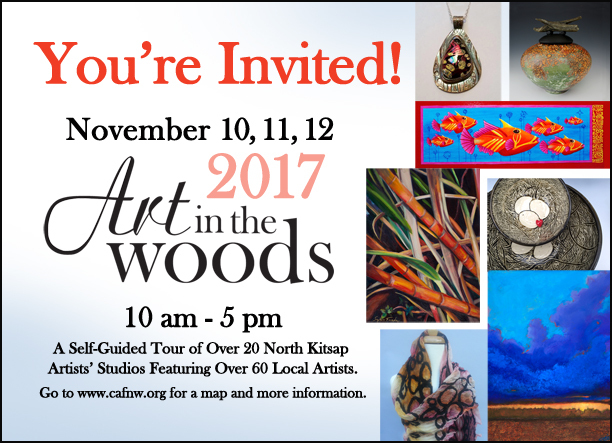 Many of the paintings done at PTP 2017 will be displayed at Arts in the Woods. The knowles Studio will be open 10am-5pm, Nov 11th, 12th and 13th . Please stop by and say hi! Hope to see ya there! 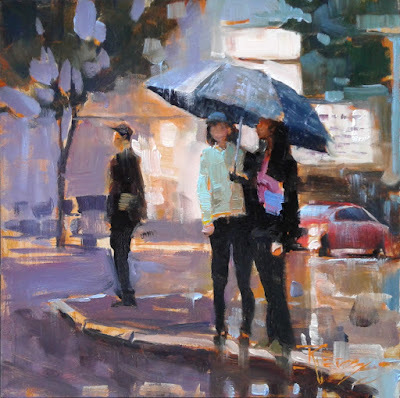 I have to cut in on my posts of the Cole Gallery featured artist show to announce the opening of the Michael Birawer Gallery in Seattle. We have been waiting for this gallery to open after Alki Arts closed last year. 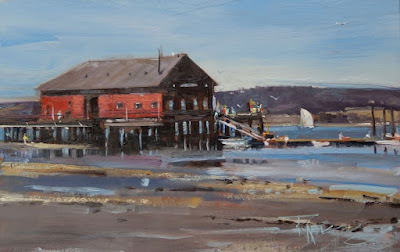 Diane Venti will be the gallery director for this exciting new venue and will be rotating some of the Alki Arts artists along with new art and prints from Michael Birawer. 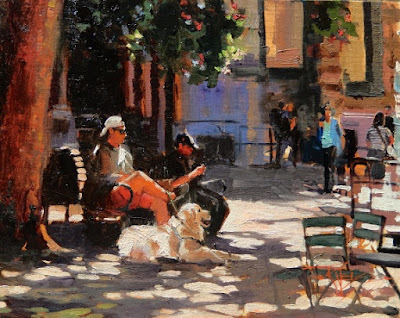 The Gallery is located on First Ave between Storyville Coffee and the Alexis Hotel . 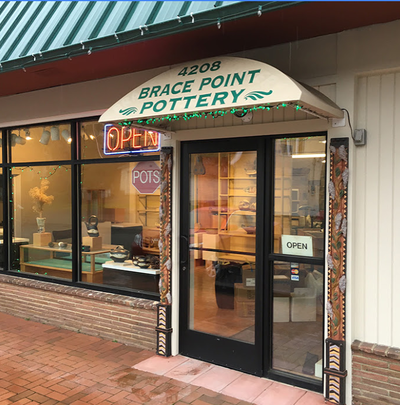 There will be an opening of the new gallery on First Thursday Artwalk , Nov., 2nd 2017 and the Grand Opening on Nov 11th. For more info and to follow along on gallery happenings for now check out the Michael Birawer Facebook Seattle page. In the next few posts I will be adding work that is included in the Cole Gallery, Featured Artist show "Seattle, Edmonds and Beyond with myself and Jennifer Deihl that will be showing through December. What a busy couple months! 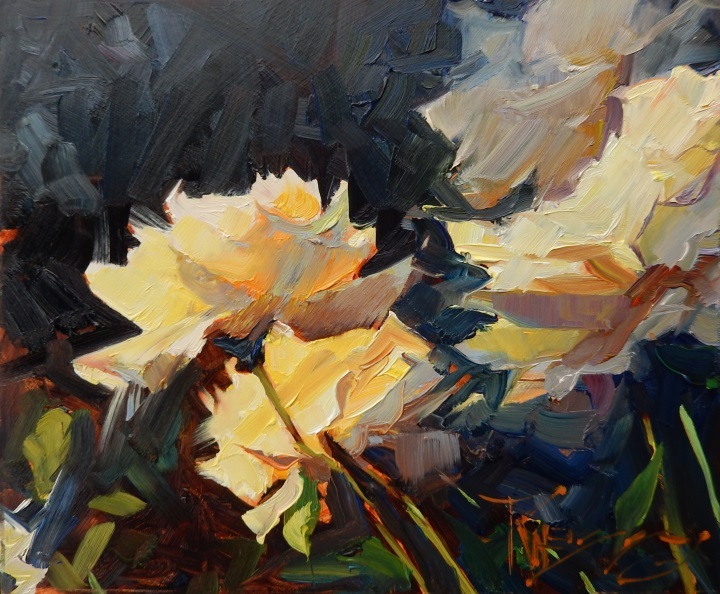 I missed posting about the opening of a recent featured artist show with myself and Jennifer Diehl but go and check it out if you are in the Edmonds Washington area! The show will be hanging through December and you can view the paintings on the Cole Gallery website HERE. The first Thursday of the Month is Seattles art walk and I am excited to announce that Alki Arts has teamed up with Michael Birawer to open a new gallery in Seattle next to the Alexsis Hotel on First Ave. The opening of the new Michael Birawer Galley will be Thursday, November, 2nd , 6-8pm . Hope to see you there! 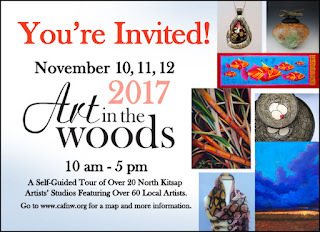 Next in the line up, Our annual studio tour, Arts in the Woods! 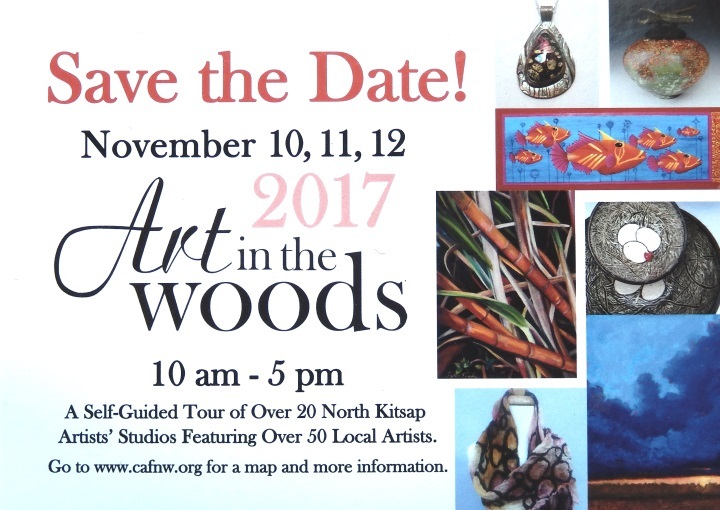 Don't miss this art smorgasbord of local studios in the North Kitsap area! 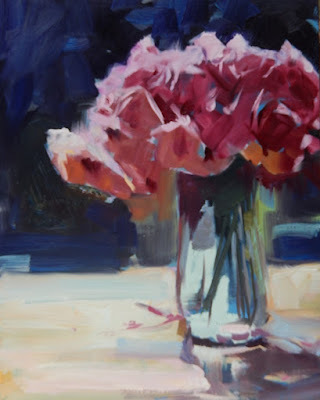 A three day extravaganza of creativity for your enjoyment! Find me at the Knowles Studio and get your map or go to the Cultural Arts website HERE for more info. 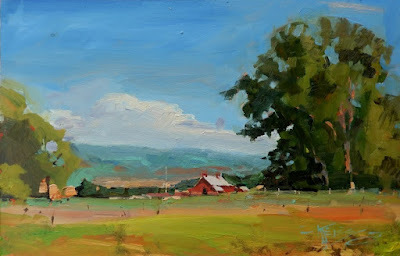 Plein Air Washington Artists. Always a great show and fun time to meet the artists! Tim Deibler is this years juror of awards. Juried into "Valleys to Vinyards"
"Three Poppies" plein air poppy painting by Robin Weiss. Also upcoming events. Other events coming up: The closing party for the Brace Point Pottery show in West Seattle check out their website HERE. I will be painting a demo during the party....should be fun!! Diane Venti will be there and it's always fun to give her a big hug! 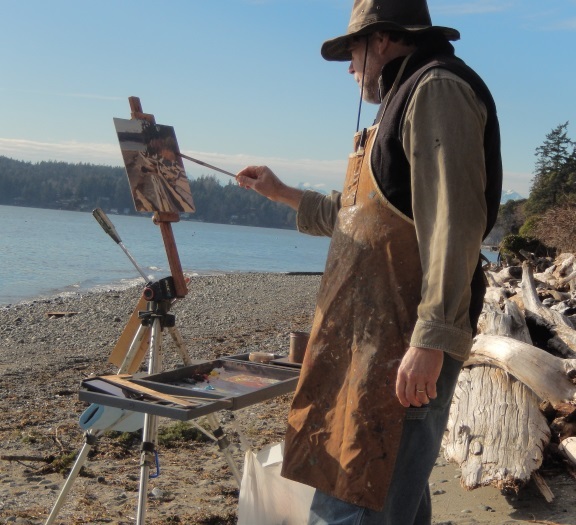 A featured artist show coming up at the Cole Gallery in Edmonds. 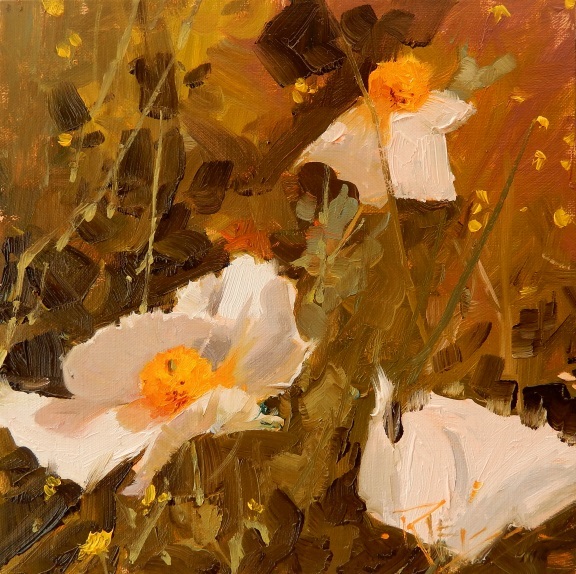 Opening on the 19th of October, 6-8pm during third Thursday Art Walk in Edmonds. 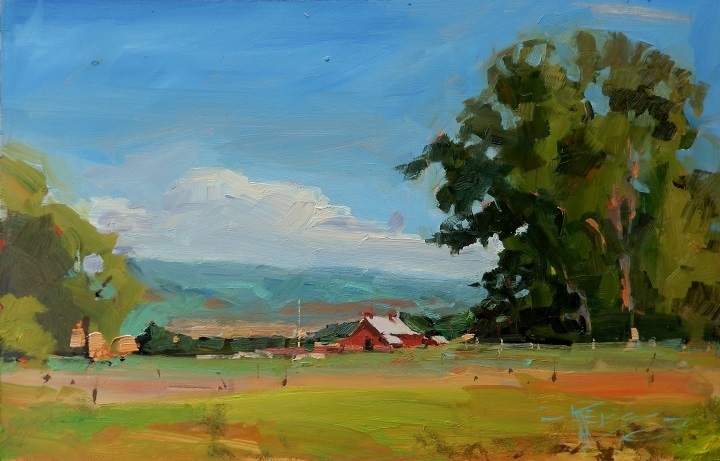 Come by and see recent plein air and studio work from travels this summer! 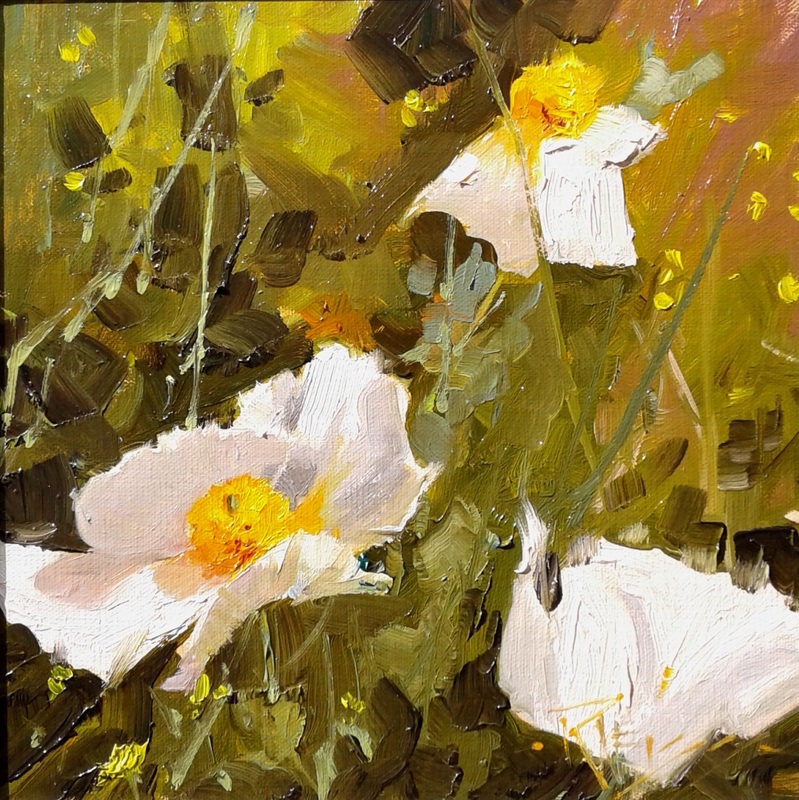 White poppies, like white crepe paper glued to bright yellow cotton balls blowing in the wind...So much fun to try and capture on canvas! It was kind of like gesture drawing from life. Irresistible! Yep, I did a whole series of these poppy paintings during a very warm summer week. I do get these short lived artistic obsessions with certain subjects....Then I have to get it out of my system. 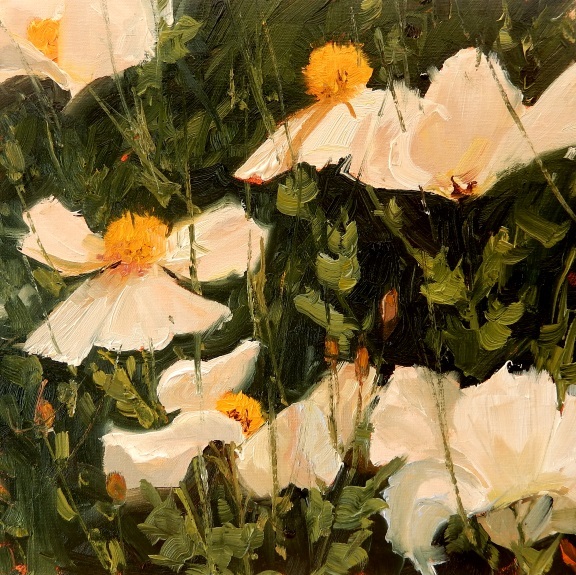 Leigh has these poppies growing in her "White" garden....Some people call them "Fried Egg Poppies" but I researched them and found that they are native to Southern California into Mexico. 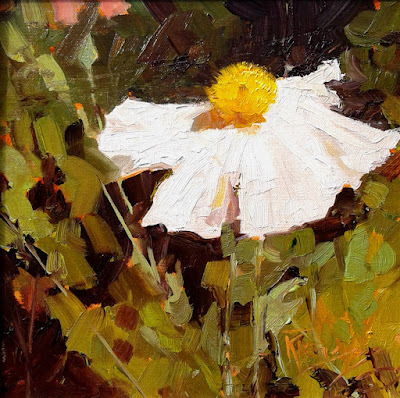 The formal name is Matilija Poppy. 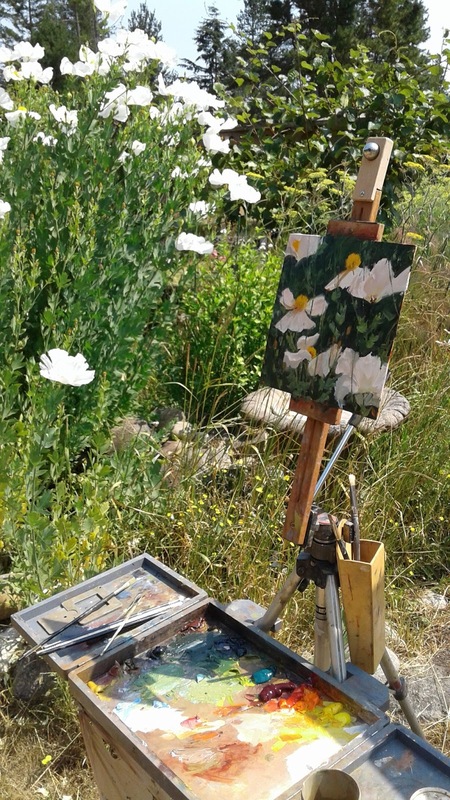 Been wanting to paint them for years and finally got around to it with a series of paintings.This is the first done on a windy day when the crepe paper white blossoms were blowing about and dancing in the wind. Seattle is changing so rapidly now that I'm not sure this view will be possible to see in the pretty near future. With the new tunnel nearing completion, the Viaduct due to be demolished soon and the start of a complete rebuilding of Coleman Dock, the Seattle waterfront is going to be radically changed from what we have been used to. People say it will be much improved but the grungy, gritty city look of the old Waterfront will be missed by some, including me. This view looks north down Western Ave as you cross the skybridge from Coleman Dock. 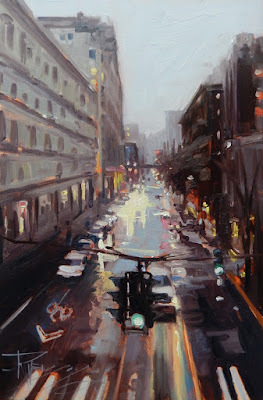 I've painted so many Seattle City, rainy day paintings that I am starting to run out of names to call them! Pretty sure I have used this name before . I used to walk this way several times a month getting to the gallery on First and Seneca. 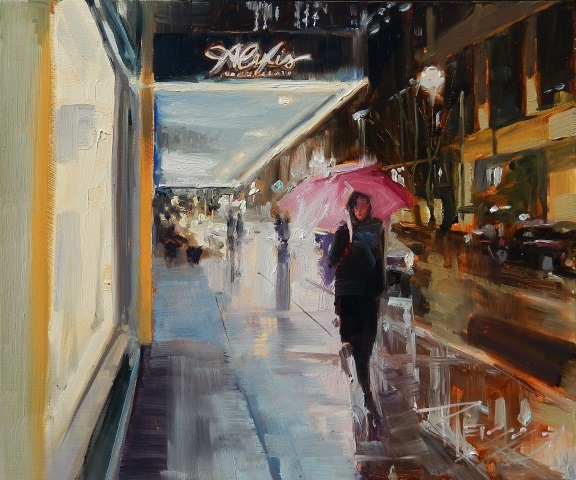 It's interesting any time of day but especially on those rain drenched nights with the light bouncing off the puddles and folks with their umbrellas. Oh man am I behind again! 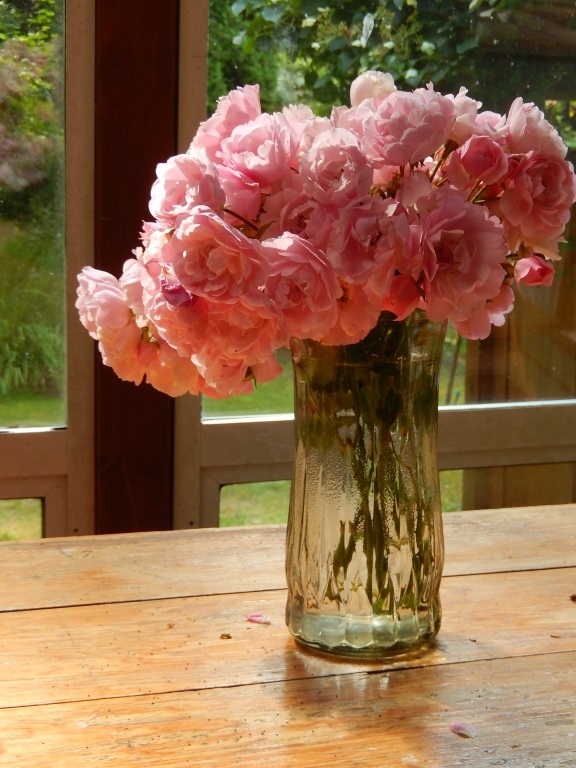 Lots going on but will make an attempt to catch up...I know, I know Ive been saying that! Ha! 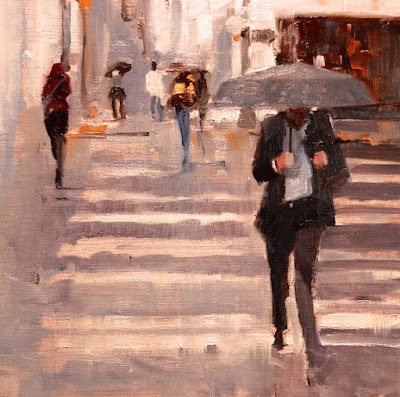 This was a quick study to explore gesture and distance in the figures walking. Notice that the heads are on the same plane but the legs are shorter. This happens because your eyes, (which are in your head =] ) becomes the horizon line in your one point perspective. The perspective would change of course, if you were laying down on the sidewalk or standing on top of a building or looking down a steep hill. If you want to draw city scenes its important to study perspective. Start out with simple one point perspective and have fun with it! 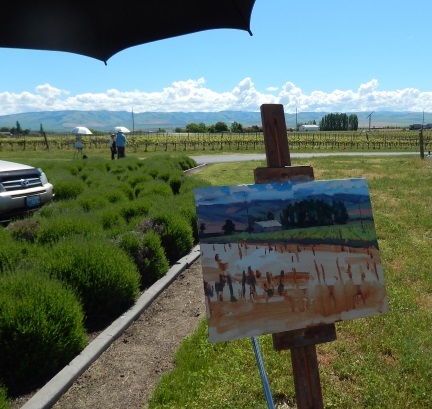 After visiting a few vineyards in Walla Walla we went to Benton City about an hour away and stopped to paint at a few more. 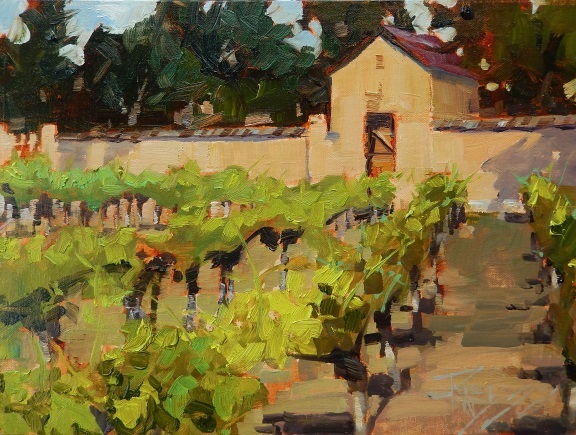 This is the hedges winery and vineyards which features a beautiful tasting room and stunning grounds. 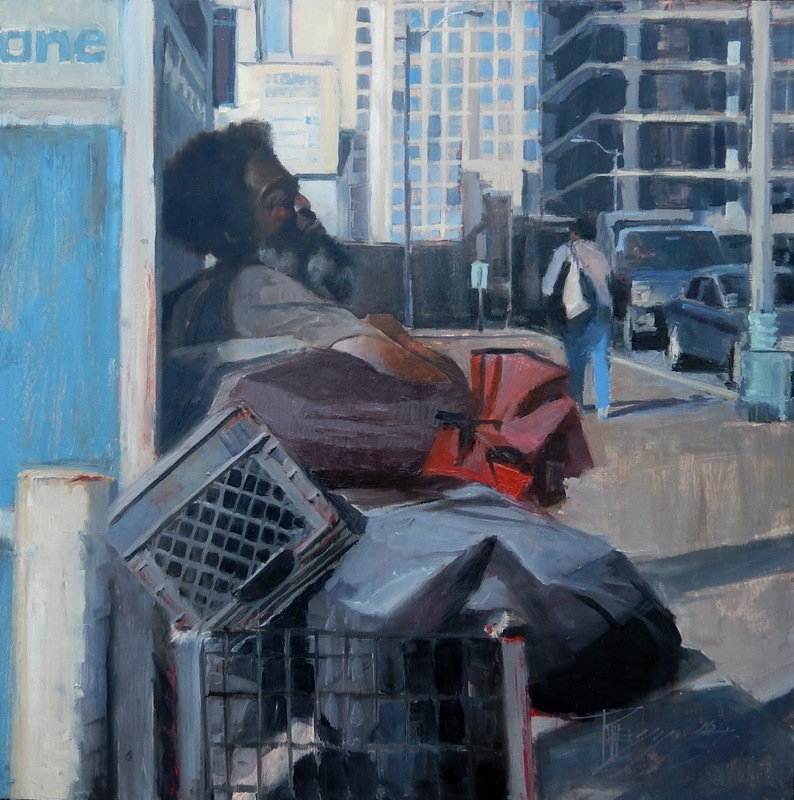 THE EVENT:Unity at the Bemis is a juried and curated charitable art show running Aug 4-6th at The Bemis Building in SoDo, less than 2 blocks from The Seattle Art Fair at CenturyLink Field. The goal of this community-centric art show is to raise at least $25,000 to support local homelessness through the work of Facing Homelessness - a direct-action non-profit that works closely with homeless citizens. 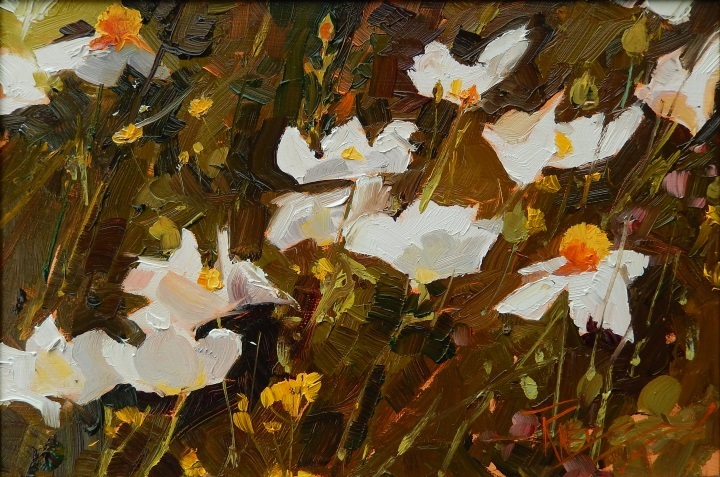 The show will feature between 40-50 Northwest artists, with affordable art up for sale throughout the 3-day event. I have been suffering from "bloggers block" again..Something keeps me from the blog..I think about it but just put it off, and the longer I put it off the harder it is to get back to it....funny,..does that happen to you? We visited several vineyards in the area and painted studies in preparation for our annual show in the fall at the American Art Company in Tacoma WA. 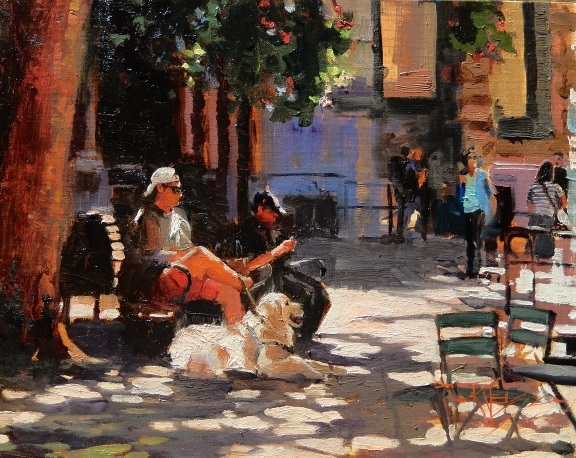 This show always exhibits a plein air study accompanied by a larger studio painting. 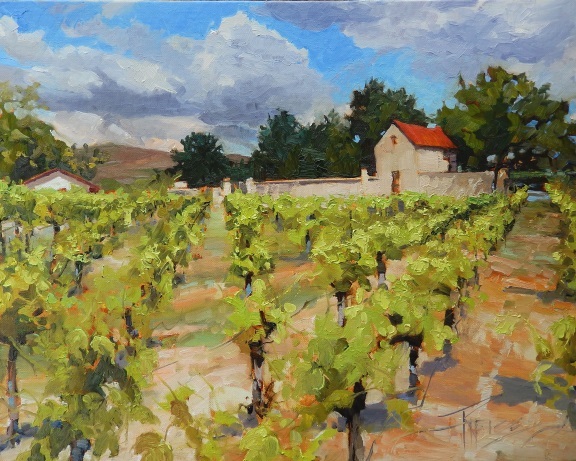 This years theme is "Valleys to Vineyards"
last month I got away to paint down in Indianola. I forgot how nice the beach is there on a sunny day even in early spring. It was very peaceful and not nearly the crowds of summer! Lately I have been getting lazy and not taking the time to do a thumbnail sketch...Not good!! You get a lot more failures that way!